MORHAIM CONSULTANT TO POTENTIAL POT FIRM: The state lawmaker who led the effort to legalize medical marijuana in Maryland is part of a company trying to sell and profit off the drug — a position he never disclosed as he pushed bills and regulations to help cannabis businesses, Fenit Nirappil and Aaron Gregg report for the Post. Del. Dan K. Morhaim ­(D-Baltimore County) is the clinical director for Doctor’s Orders, according to a portion of a dispensary licensing application obtained by the Post through a public records request. SCHOOL REPAIRS IN JEOPARDY: At Prettyboy Elementary School in northern Baltimore County, workers are tearing up worn carpeting and replacing the floor as part of a $200,000 project paid for by Maryland’s Aging Schools Program. Michael Dresser of the Sun reports that all over Maryland, dozens of similar state-financed projects are in the works in public schools, but the program could grind to a halt if Gov. Larry Hogan decides not to release $6.1 million the General Assembly set aside for it in this year’s budget. JUSTICE REFORM GLITCHES: Maryland’s recently-passed Justice Reinvestment Act hopes to remove barriers to reentering society, including finding employment, through tools like expungement of certain offenses. If an expungement is not properly reported, however, the record can still come back to haunt someone. Heather Cobun of the Daily Record writes about this and other “infrastructure” problems that are harming ex-offenders as they seek jobs. KELLEY REPLACES GLADDEN: Veteran Baltimore County Sen. Delores Kelley will replace the city’s Sen. Lisa Gladden as vice chair of the Senate Judicial Proceedings Committee, Senate President Mike Miller said Friday. Kelley, 80, will move from the seat she has held on the Finance Committee since 1998, Michael Dresser writes in the Sun. Gladden will move to Finance, the committee on which she served when she was first elected to the Senate in 2002. Gladden, 51, was temporarily replaced on the key committee by Sen. Nathaniel McFadden, D-Baltimore City, after Gladden was hospitalized in hospitalized early March while battling multiple sclerosis — a disease she was first diagnosed with nearly 20 years ago, writes Bryan Sears for the Daily Record. ON CHRIS SHANK: Ovetta Wiggins of the Post profiles Christopher Shank, the former state senator who as a Republican state delegate was known as a bomb-thrower, only to become a thoughtful lawmaker who could put aside partisanship. It is the deliberative legislator willing to work on both sides of the aisle whom Gov. Larry Hogan (R) has chosen as his chief legislative officer to reach out to a solidly blue legislature that has clashed with the governor repeatedly. ALL’S NOT WELL WITH WELLS: A new study by the U.S. Geological Survey has found that well water is often so corrosive that it can leach lead from pipes and fixtures sufficient to endanger children. The assessment of about 20,000 wells found that half of states face this potential threat, with groundwater samples in Maryland and much of the Northeast and Deep South determined to be corrosive enough to place those areas at “very high” risk. Roughly one of out of six Maryland residents gets their drinking water from a well, the editorial board of the Sun writes. JUDGE APPOINTEE DRAWS FIRE FOR GUN COMMENTS: A recent appointee to the Caroline Circuit Court is drawing attention for his vocal advocacy on gun-related issues, reports Bryan Sears for the Daily Record. Advocates who support stricter gun regulations say the comments made by current Caroline County State’s Attorney Jonathan Newell raise eyebrows. A spokesman for the Gov. Larry Hogan was dismissive of the exchanges on social media and a number of hunting-related websites, saying they were done on Newell’s private time and should not factor into his appointment to the bench. Convention delegates are posting lots of photos of travels and preconvention activities. 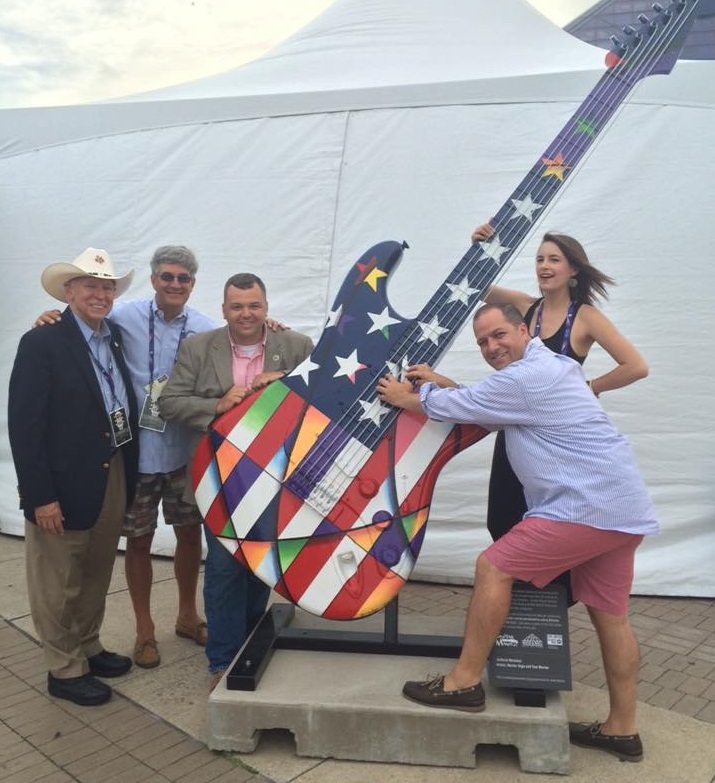 Here, from Don Murphy’s Facebook page, at the Rock and Roll Hall of Fame are, from left, an unidentified man in a hat, Don Murphy, Senate Minority Leader J.B. Jennings, John Fiastro, chief of staff to the Senate minority whip and Kendall Murphy. HOGAN’S NAVIGATION SKILLS: Throughout the 2016 primaries, national figures like presumptive Republican nominee Donald Trump and Vermont Sen. Bernie Sanders enthralled primary voters with hardline ideological positions. But Maryland Gov. Larry Hogan took another approach — a form of moderate populism with bipartisan appeal, write Josh Magness and Jessica Campisi. To gain support in a strongly blue state Republican Hogan has centered his efforts on fiscal policies while staying away from social issues. PENCE GOOD FOR TRUMP CAMP: Maryland delegates to the GOP convention are saying that Donald Trump’s choice of Mike Pence as his running mate is a very good choice for the ticket and should improve Trump’s chance of winning at the polls, CNS reporters write in this MarylandReporter story. This is a big week for Republicans – their quadrennial national convention in Cleveland. For Maryland’s conventioneers, it’s “Donald Trump All the Way.” Nary a discouraging word will be heard from them – unless they’re talking about Hillary Clinton, opines political commentator Barry Rascovar in MarylandReporter.com. The state’s GOP delegates’ loyalty to Trump, the party’s flamboyant and controversial presumptive nominee, was sealed when the New York real estate tycoon thrashed Texas Sen. Ted Cruz and Ohio Gov. John Kasich in the April 26 Maryland primary. Carroll County Republican Central Committee member Larry Helminiak is one of the delegates to the convention who will be on hand to cast a vote for Donald Trump as the GOP nominee for president, Jon Kelvey and Heather Norris report in the Carroll County Times. “I am excited about it because … if we don’t save our country this time, it’s going to be trouble for a very long time. The country that people my age have seen and grown up and with will cease to exist,” he said. TRUMP BEHIND THE SCENES: In a column for the Post business section, longtime business reporter Allan Sloan writes about his three decades of reporting on Donald Trump and his ventures. Trump’s biggest problem that has proved detrimental to him and could be detrimental to the country should he win. He lacks impulse control. HOGAN SITS OUT CONVENTION: While some prominent Republicans will reach for pierogies or Polish Boys in Cleveland this week, Gov. Larry Hogan will be reaching for Old Bay instead. Instead of attending the Republican National Convention, Hogan will attend the Tawes Crab Feast and Clam Bake with other Marylanders. The moderate governor isn’t alone in skipping the convention. He joins other notable party figures, such as Florida Sen. Marco Rubio, Ohio Gov. John Kasich, 2012 GOP nominee Mitt Romney and three members of the Bush family: former Presidents George W. Bush and George H.W. Bush, as well as former Florida Gov. Jeb Bush. Jessica Campisi and Josh Magness of CNS write in the Annapolis Capital. Not even the governor of Maryland can resist Crisfield in July. Larry Hogan and many more will be chowing down on seafood at the Somers Cove Marina on Wednesday, July 20 for the 40th Annual J. Millard Tawes Crab and Clam Bake, Mitchell Northan writes in the Salisbury Daily Times. O’MALLEY STUMPS FOR CLINTON: Former presidential candidate and Gov. Martin O’Malley was to hit the campaign trail for Hillary Clinton in Pennsylvania and New Hampshire this past weekend, John Fritze reported in the Sun. CLINTON, TRUMP INVITED TO B’MORE CONVENTION: The National Urban League will invite Hillary Clinton and Donald Trump to Baltimore in August to address issues challenging American cities at its annual convention, the group’s president said Friday. Yvonne Wenger of the Sun writes that Marc H. Morial, the league president, said the annual conference typically features top presidential candidates. Neither of this year’s presumptive nominees has confirmed attendance, he said. DIFFERENT LEADERSHIP SOUGHT FOR PLANNED PG HOSPITAL: State officials weighing an effort by Prince George’s County to launch a new regional medical center have one common concern: Dimensions Healthcare System, the long-troubled nonprofit that has operated hospitals in the county for decades, reports Arelis Hernandez in the Post. Early this year, when Gov. Larry Hogan balked at giving millions of dollars to keep existing county hospitals afloat while the new one is built, he wanted assurances that Dimensions would not play a role in running the new medical center. COURT TO HEAR AA ED BOARD DISPUTE: Maryland’s highest court will hear in November a dispute over a law that changed the composition of the government body that recommends county Board of Education candidates to the governor. The outcome of the School Board Nominating Commission case may affect who will sit on the nine-member Anne Arundel County school board, which votes on system policies and budgets, Cindy Huang reports in the Annapolis Capital. CIA FRAUD SENTENCED: The Annapolis man who appeared as a guest on Fox News claiming to be an ex-CIA employee was sentenced to 33 months in prison on Friday. In addition, 62-year-old Wayne Simmons was ordered by a U.S. District Court judge to serve three years of supervised release, forfeit two firearms and $175,612 in criminal proceeds, and to pay restitution to his victims, the Department of Justice said Friday. Prior to Friday’s sentencing, former Maryland Gov. Robert Ehrlich wrote a letter on Simmons’ behalf to the judge, Phil Davis reports in the Annapolis Capital. MARR REMEMBERED AS BROADCAST GIANT: Tom Marr, the longtime conservative radio talk-show host who earlier in his career was a play-by-play announcer for Orioles games, was recalled at his funeral Mass on Friday as a broadcast giant and an innovator, writes Maya Earls in the Sun. FORMER CAPITAL PUBLISHER DIES: Eleanor Merrill, of Arnold, former publisher of the Annapolis Capital, prominent philanthropist and wife of the late Philip Merrill, died on Friday. She was 82. A memorial service will be held at noon Friday at the Chesapeake Bay Foundation’s Philip Merrill Environmental Center in Annapolis. In lieu of flowers, the family requests donations be made to the Chesapeake Bay Foundation or the University of Maryland School of Journalism, reports the Capital’s Lauren Loricchio.